The recent news of decamping by the Imo State Governor in the person of Gov. 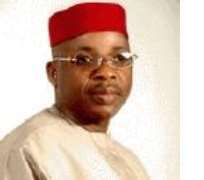 Ikedi Ohakim from the Progressive People's Alliance [PPA] to the People's Democratic Party [PDP] has began to show signs of reverberations in the various quarters of Imo political sphere. Particularly it appears to not seat well with grassroots in and around Imo State. This is as Ukpakareports.com gathered that youths and other angered citizens of Imo State have begun aggressive mobilization against the government of Ohakim. Information available to our correspondent indicates that the mobilization against the government of Ohakim based largely on the grave dislike of the PDP in the State has in turn drawn its strength out of the opposition parties made up largely of All Progressive Grand Alliance [APGA] and PPA sympathizers. Among the midst is the fledgling number of disgruntled PDP chieftains spread across the South East. Impeccable information available to Ukpakareports.com indicate that youths in Imo State made up of MASSOB freedom fighters and other vigilante outfits have concluded plans on the hazing down of the government house with fire bombs. According to a security report, the youths are being mobilized by financial heavy weights from the northern part of Nigeria, in the likes of the former military dictator of Nigeria, Ibrahim B. Babangida, and a former minister during the Obasanjo regime, Gov. Goje and two former governors of the South East. As understood, the vigilante group will disguise their attack to fit the patterns and traits of that of robbers and/or kidnappers. This is as the attack is said to take the form of a bombing attack rather than of a gun shoot out. Ukpakareports.com reached out to the leadership of the PPA regarding the defection and the unfolding threat, a source within the PPA leadership indicated that the rumor of an attack on the Imo State government house is alive within their quarters. But clarified however that the PPA leadership is not involved in such activities. Confirming this notion is a high ranking member of APGA who is currently in court with Ohakim, indicated that there has been an increase in meetings of vigilante groups in Owerri following Ohakim's decampment. This was while he cautioned that it may not necessarily be related to the widespread rumor of an attack on the government house.